On Thursday November 6, AIGA Santa Barbara hosted "The Art of Music" event at the historic Balboa Building in Downtown Santa Barbara. The event featured a panel of music industry professionals, a live DJ, and networking opportunities for all attendees. 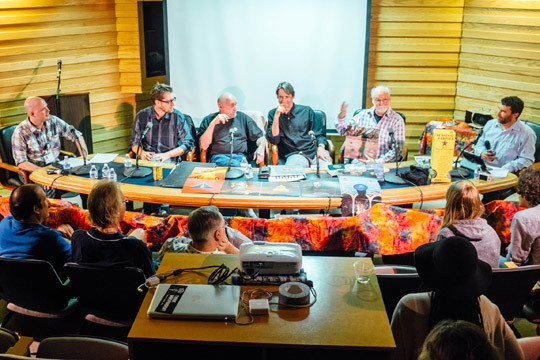 Panelists at this epic event included Hale Milgrim, the former President/CEO of Capitol Records, John Kosh, the Principal at Ten Worlds Records, Andy Engel, the Principal at Andy Engel Design Inc., and our very own Jacob Tell, CEO and Creative Lead at Oniracom. A magical night of story telling and discussion, these knowledgable panelists spoke about their personal connections to music as inspiration and work, the idea conception and execution of album artwork creation, challenges and rewards of working closely with various artists over time, and more. Jacob spoke specifically about "how the design and marketing of merchandise (apparel, souvenirs, etc.) drives artist profits in place of dwindling returns from recordings." It was great to see such a positive turn out for the event and, as John Kosh put it, "a splendid time guaranteed for all." Read more about the event on the Solutions for Dreamers blog! Read the AIGA Event Recap here.